During Christmas 2005, my sister Sooz, her husband Terry and their two kids Sam and Max came out to visit. Connor was there too. 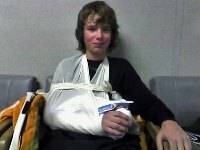 Unfortunately Sam broke his arm skiing on the first day of a 10 day skiing vacation. Bummer. We all had a great time though.